Our landscaping installation crews are highly trained and committed to high-quality workmanship and customer service. We take care of your project from beginning to end, from site prep and correct drainage issues through hardscape and landscape installation. Our design experience can create an outdoor space that is beautiful, distinctive, livable and truly sustainable. We make sure the right plants and are chosen for the right place ensuring your landscape thrives and can be properly maintained. Our horticultural knowledge and design expertise allow us to create a plan that offers seasonal interest and contrasting textures, colors and shapes. Sam Whitehouse holds the designation of CLT (Certified Landscape Technician) and Certified Arborist. His comprehensive knowledge of plants, lawn, and maintenance strategies will add value and beauty to your property. Flat out, this company is top notch. 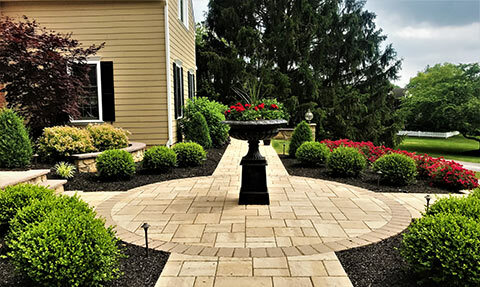 They return phone calls, quote accurately, show up on time and clean when they leave... their work is excellent... Sam and Ted are perfectionists and they have a solid, reliable crew with true plant and hardscape knowledge. What Makes a Good Landscape Installation? Whitehouse Landscaping installs only the highest quality plants obtained from highly reputable distributors. Each planting installation we perform is backed by a one year warranty. We will replace one time, without charge, any woody plant – tree, shrub, evergreen, groundcover or vine – planted by us that dies within a period of one year from the date of installation.